All I can say about Vess is that it’s still… interesting. This is definitely one of the more complex things I’ve ever worked on, as well as one of the more elegant. I did a lot of plumbing on how the driver works which is now enabling so interesting and rapid progress. Some of the really fun things are actually the most subtle. Wherever possible Vess tries to supply metadata for a modeled table that matches up with Essbase semantics or naming limits. For example, substitution variables are in a table where you have the variable name, value, application, and database. Each of these columns are normal String columns but they have character limits that match the maximum Essbase length (320, 256, 30, and 30, respectively, taking into account Unicode). Similarly for member names on the data load table. Also wherever possible, a primary key or nullability constraint is set on a table where it also makes sense. For example, substitution variables are assumed to be non-null, as well as member names for an Essbase fact table, cube names, and more. 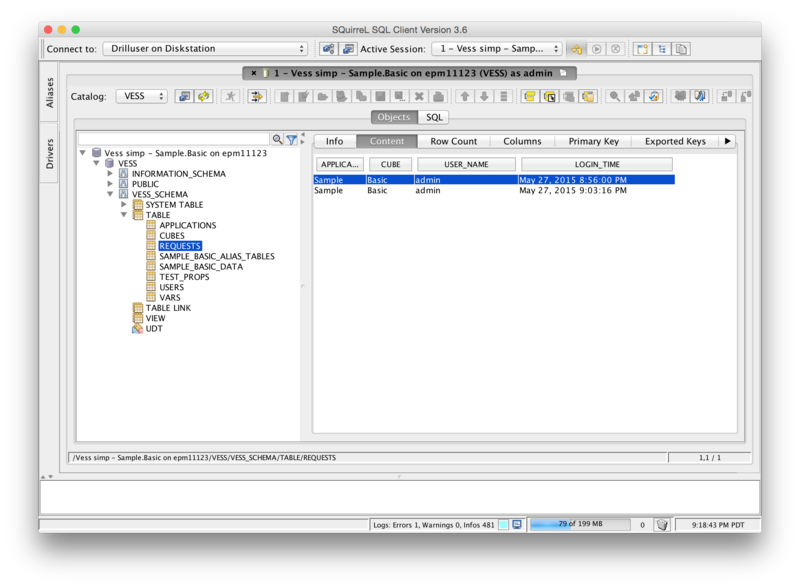 Some of the tables also support DELETE semantics, for example, deleting a row from the session table is equivalent to killing the session, as with substitution variables. Lastly, all tables that are modeled in Vess are part of the SQL metadata store, so that tools that go in to ask for metadata (such as Squirrel) get it back. This is interesting/notable because theoretically you could already use Vess with ODI to perform data loads and some other things. I haven’t tried this yet, but theoretically I could add the drivers, reverse the metadata, and use one of the tables in an interface. So it’d be fairly trivial to update a substitution variable directly from SQL, perform a data load, and you could even kick off a calc script simply by invoking a procedure.